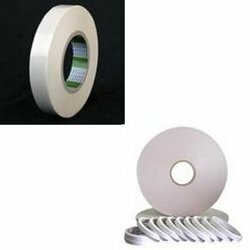 Our customers can procure from us Double Sided Tissue Tapes, made using tissue paper along with coated acrylic water or solvent based adhesives on both sides. Offered range is used in leather industry, foam industry, postal services, labels and in several others. 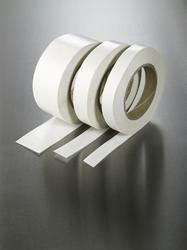 Having optimum strength, these tapes can be purchased at reasonable rates. a ) 6 mm X 45 Mtrs = 432 Rolls Per Cartons. b ) 8 mm X 45 Mtrs = 324 Rolls Per Cartons. d ) 12 mm X 45 Mtrs = 216 Rolls Per Cartons. e ) 15 mm X 45 Mtrs = 180 Rolls Per Cartons. Looking for Double Sided Tissue Tapes ?